Whatever side of the political fence you’re on, you must admit that nobody running for presidential office in 2007 or 2008 can deliver a speech quite like Barack Obama. Just like — as both a Democrat but also one who resides in Arizona — I can say many positive things about Senator John McCain, Obama’s ability to inspire, fire up, engage, draw laughter and tears (sometimes within the same five minutes) from the most diverse crowds on both ends of the political spectrum is admirable, enviable, and thrilling. Thus, it makes the endless comparisons to JFK and Martin Luther King Jr. seem warranted and at the same time, reminds us that in the future, other politicians, as Michelle Obama noted in her UCLA rally speech, will be held up to the same public speaking “bar” that he continually leaps over once it's set. In the wake of 24 hour news channels, political pundits and bloggers, fake news hosts on Comedy Central, and YouTube, it’s easy for speeches to get distorted and misleadingly edited to whatever selective reality the “producer” of the content decides to put forth. So in order to avoid the sound bites and spin that distract and distort rather than engage and inspire, host Pearl Jr. notes that the purpose of the ROCKCITY and MVD’s DVD Barack Obama: The Power of Change was to not only give viewers a chance to own their own personal piece “of history” (making it valuable for school and university libraries) but also present several important speeches associated with Obama’s historic presidential campaign. Offering viewers the opportunity to jump directly to the speeches they most want to analyze and/or cherish, the well-intentioned yet uneven and poorly executed disc doesn’t quite provide as unfiltered of a presentation as our host had promised. Beginning with Obama’s famous announcement in Illinois, the film footage of what is inarguably one of the most momentous political events of our generation is hindered by home video quality footage that’s difficult to hear at times. Additionally, it’s also annoyingly inter-spliced with pointless Power Point-styled factoids complete with an overuse of the exclamation point about Obama’s love of basketball and obvious statements like “affordable healthcare is an important issue in America” that were even more distracting than CNN’s perpetually moody Lou Dobbs and the infamous bottom-of-the-screen “crawl” combined. And indeed throughout the DVD, unfortunately, microphone trouble seemed to be the biggest obstacle as the echo of the sound made certain sentences indecipherable and closed captioning would’ve helped bring Obama’s message to all viewers from the hearing impaired to the elderly in a much more effective way. Likewise, in this era of so much coverage, no doubt, there were far more professionally photographed documentations of the same events available to use instead, although of course budget would be a concern and I greatly appreciate and admire the intentions of producer, host, interviewer and director Pearl Jr. However for such a technologically savvy candidate with his own overflowing Flickr Photostream and hundreds upon hundreds of videos via his YouTube Channel that can be freely accessed by interested parties, we know we could’ve done better than an interview with the former model Tyson Beckford. Yet despite this, certain interviews and speeches are incredibly revealing including Mitchell Schwartz’s address regarding Hillary Clinton’s years on the board of Wal-Mart in the 1980s as well as Oprah’s famous take on the candidate. But unsurprisingly, the disc is at its most powerful when it focuses exclusively on the Obamas. Of course, while the greatest speaker featured is undoubtedly the main man himself, I was profoundly moved and deeply impressed by Michelle Obama’s address that not only put Oprah’s speech at the same UCLA rally to shame but also made me wish for a moment that the next time an election rolls around, she would be the candidate to run (view the entire rally here). Of course, in a year where the media seemed fit to try and polarize the country with constant questions about race and gender prejudice, the idea of an African-American woman may seem hard to fathom. Yet as a child whose earliest ambition was to be the first female president of the United States, I’m proud to have been proven wrong by such a groundbreaking year where the two frontrunners for the Democratic Party broke free of our stereotypes about all the old, wealthy white men in Washington D.C. So who knows what we can predict in the next election when we’re still trying to keep up with this one as it grows increasingly complicated every week? Unfortunately, while its purpose is far more important than its production, the disc’s shortcomings are hard to ignore. 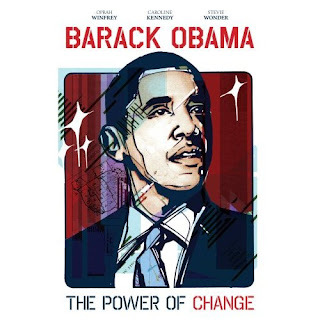 Barack Obama: The Power of Change, may not be at the same “technical” level as the candidate himself and it does grow overly long as a few segments could’ve easily been left on the cutting room floor and more biographical data could’ve been inserted to make it a far more well-rounded and educational “piece of history” to better justify Pearl’s intention. Yet, it’s still a fascinating look at a monumental campaign and would make an excellent companion piece to other materials about and/or by Barack Obama himself.